Do you want to cook the best five start restaurant recipes at home at surprise your family and friends? Are you or any of your family member is a huge fan of eating low calorie meals? 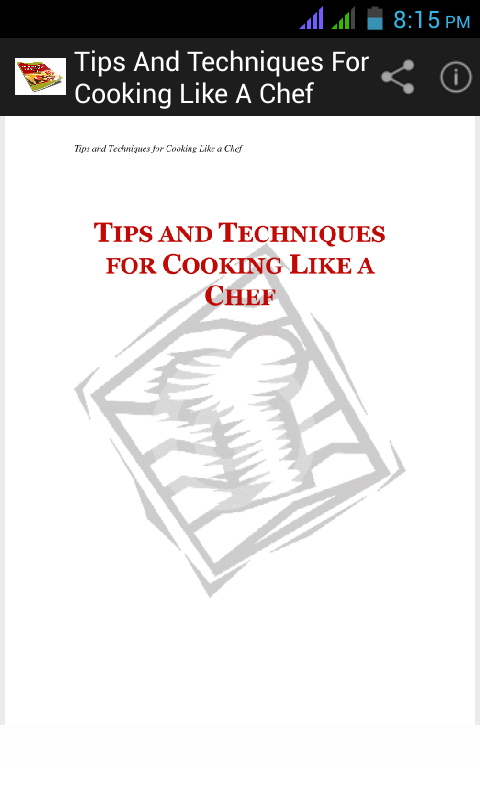 If so, our ebook app “Tips and Techniques For Cooking Like A Chef” is just the answer to all your problems. Weight issues are very sensitive, therefore it is best to play safe by cooking and eating easy healthy meals everyday to lose weight and shed those extra pounds you has put up by eating an unhealthy food. Obesity has become one of the most common health issues across every part of the world due to the unhealthy eating lifestyle people are practicing but many of them have become extremely concious about their health and so, have been looking out for ways to get back in shape by adopting a healthy eating lifestyle. 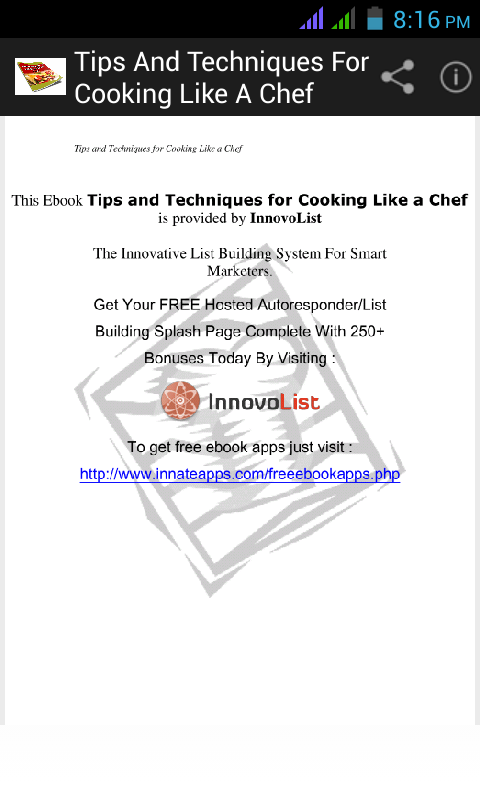 To help you do so, we have wisely designed this app with updated easy healthy recipes everyday. 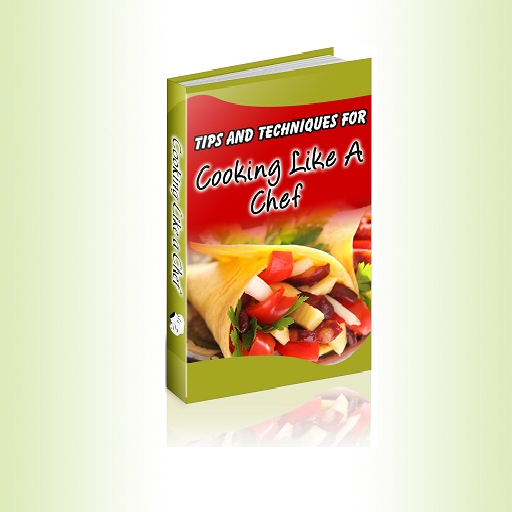 Most of the recipes are focused on low calorie meals as the low calorie ingredients and simple meal ideas can help you cook a healthy dinner in no time. Being regarded as one of the most useful and informative healthy cooking app among the busy moms, we take the pride to announce that our app has now slowly started gaining attention of many online users who are looking for the right ways to cook healthy meals. We know how difficult it is today to take out time and cook for family while leading such a busy lifestyle, that's the reason why this app has been built. To save both time and reduce stress in the kitchen, download your app now available for free at Google PlayStore and Amazon AppStore. Start your day with nutritious meals by spending some time planning out nutritious meals for your family today with our amazing and easy to use app. •	Add a little zest. •	Don’t be afraid to experiment. •	Salted butter vs. unsalted butter. •	Use your kitchen scissors. •	Cut breads and cakes perfectly every time. •	Make perfect gravy for turkey. •	Keep chicken broth handy. •	A flavorful alternative to sour cream. •	Reduce the power of garlic and onions. •	Use marinades to add flavor. •	Choose perfect cuts of red meat. •	Keep the breading on meats. •	Stop meatloaf from sticking to the pan. •	Barbecue the perfect steak every time. 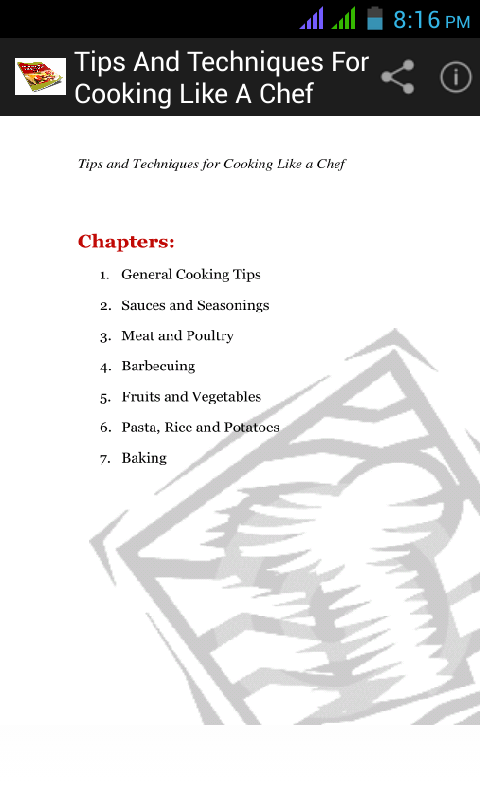 •	Prepare the barbecue grill properly. •	Never use a fork when grilling. •	Place food in the right place on the grill. •	Quick and easy corn on the cob. •	Plump up limp vegetables. •	Untangle spaghetti before serving. •	Stop cheesecake from cracking. •	Make sure your yeast is fresh. •	The key to great pastry is cold ingredients. •	Use frozen berries in baked goods.